Our December Food 'n Flix pick happens to be a movie that I love (and own), but haven't watched in a while. It's not really a foodie movie, but upon watching it again, I actually noticed a ton of food—in the background. 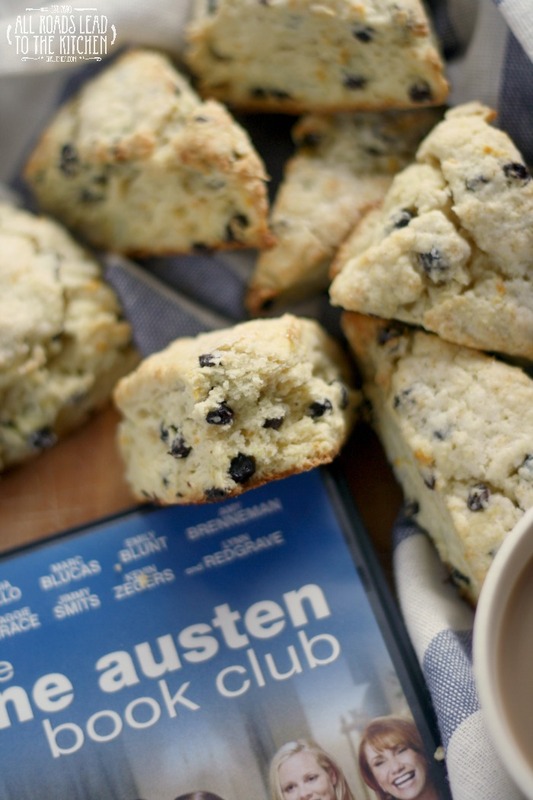 The Jane Austen Book Club is based on the novel by the same name. I haven't read it, but it's on my list...though I have heard that aside from the names of the main characters, they are dramatically different. But, today we're talking about the movie. I suppose you could call it a chick-flick. But I love chick-flicks, so that's okay with me. It's about a group of women who form a book club as a way of helping another friend through a rough spot in her life. There are four of them, but they find another woman and a guy to join them, so that they have 6 members. Since they only have a month, they decide to choose books that they've all already read (except for our sweet guy Grigg who gets thrown into the mix)...those books being Jane Austen novels. "All Jane Austen, all the time. It's the perfect antidote". I think one reason that I like the movie so much is that I can identify with each of the women on some level. They are of varying ages and stages in life, but they all battle feelings that could be inside any one of us. Plus, they have great chemistry (as does our only guy, Grigg). 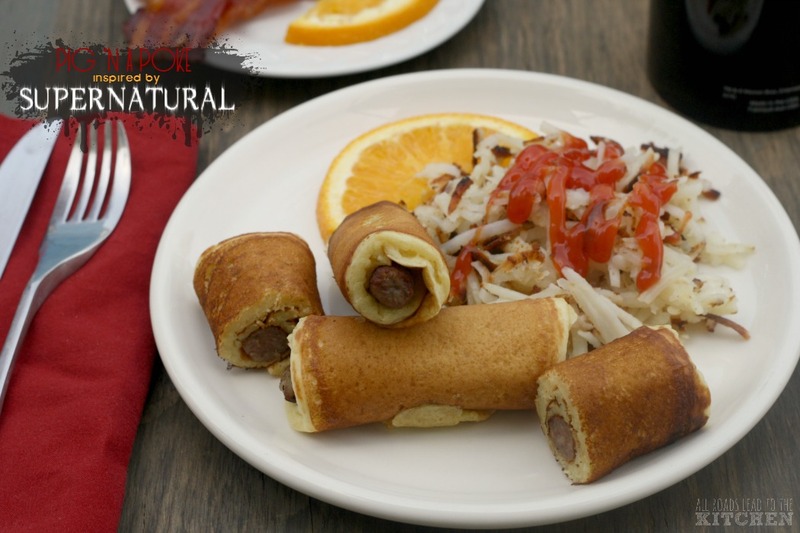 As I mentioned, food is sort of the overlooked supporting character. 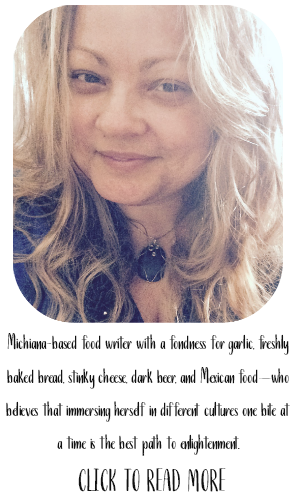 What goes better with book club than food and drink? 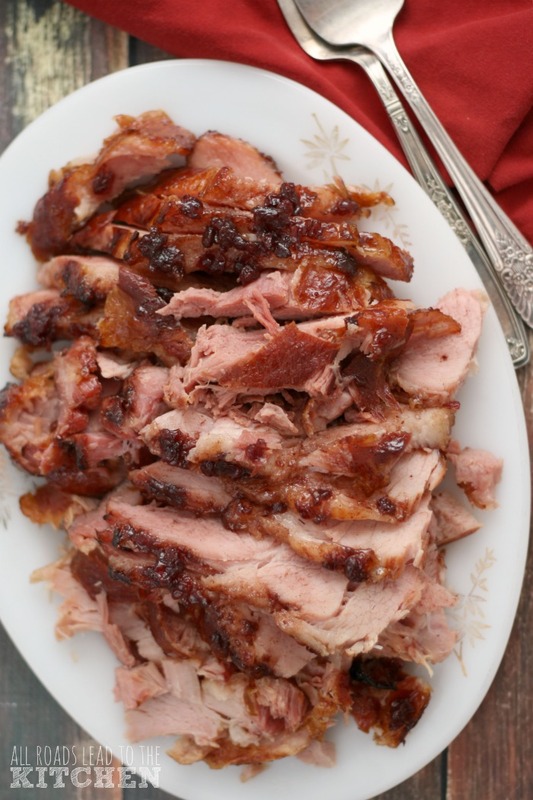 So, aside from the temptation to make the couple of dishes mentioned by name (flan, grilled artichokes, ice cream), there's plenty of food from sandwiches and finger food to mashed potatoes and brownies. And there was also a very awesome looking ice cream sundae with caramel and extra whipped cream. 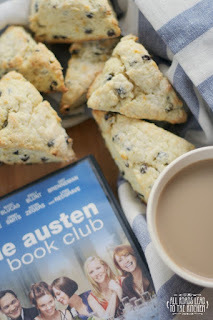 Every time I watch this movie (or any movie based on or about Jane Austen), I have the desire to be a member of a Jane Austen book (or movie) club. If life ever settles down, I may just start one myself. 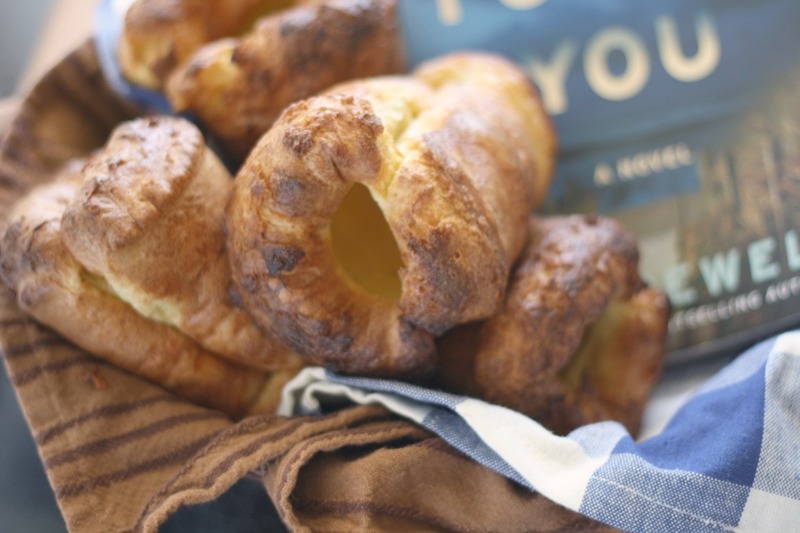 Aside from plenty of topics to talk about, from the woman to the books to the modern day interpretations, there's all sorts of food inspiration. I basically came up with the inspiration for these scones in a roundabout way. 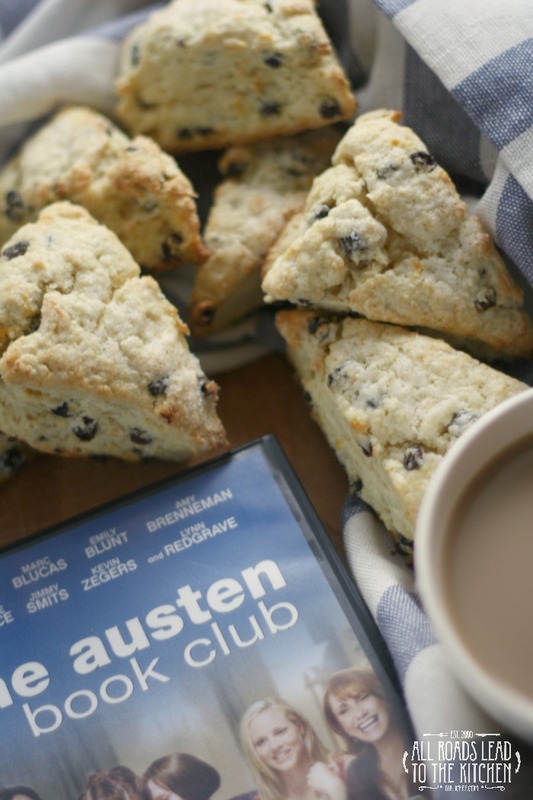 I don't think there were actually any scones in the movie, though there may have been in the background somewhere (again, food was not the focus). But one reason that I love watching movies on DVD is for the special features. So, after I watched the movie again this time, I decided to watch the special features. There's a moment where they mention that Maggie Grace (the actress who plays Allegra), though the youngest of the women, was already a huge Jane Austen fan coming into the project. She talks about bringing orange currant scones with clotted cream to the set (or maybe it was her initial reading...can't remember exactly)—and that stuck in my head. 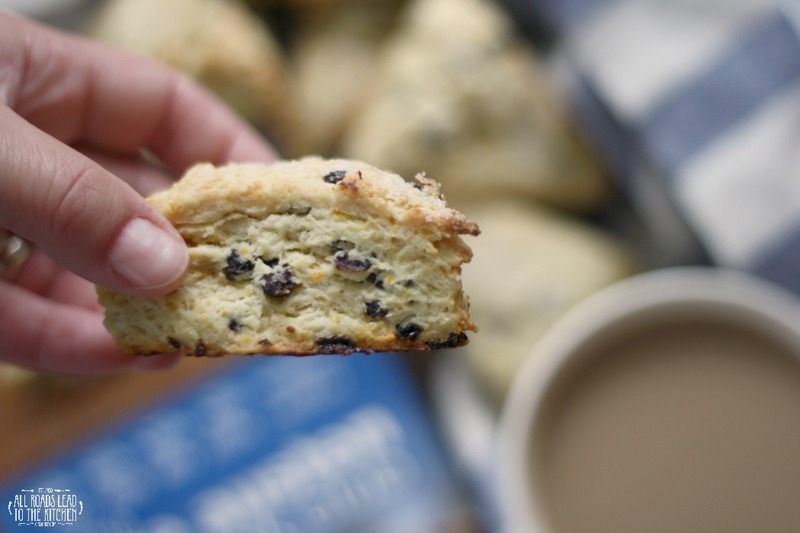 Scones are perfect for so many reasons. They were eaten in the UK in Jane's time, I'm sure. They also would have fit in perfectly at a coffee shop or book club meeting in the movie. 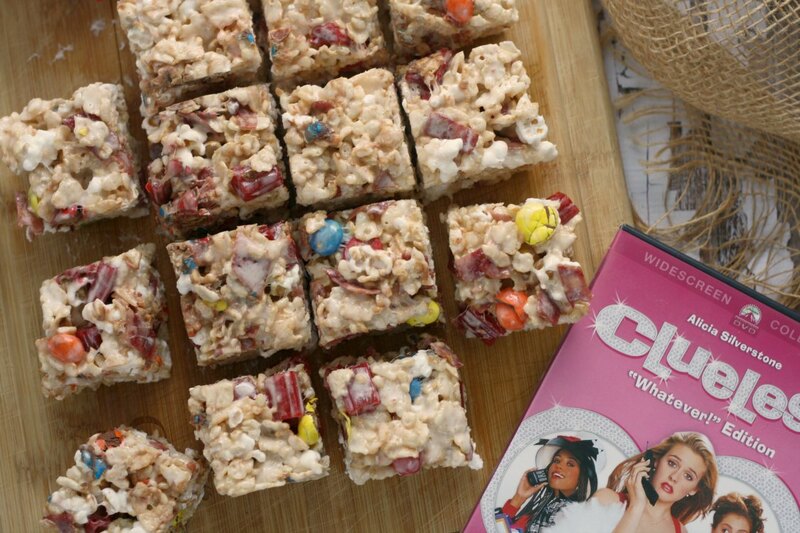 And they're one of my favorite things to make...and eat...so thanks for the inspiration Maggie Grace! 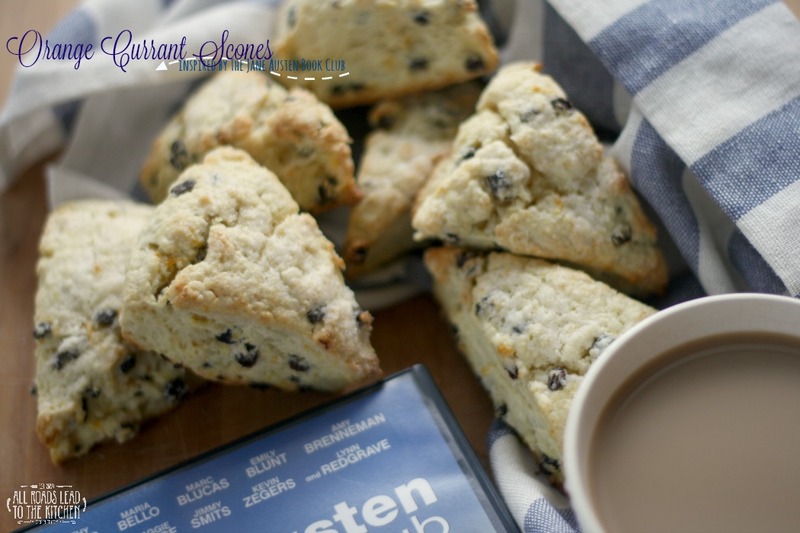 These thick, tender scones are studded with currants and fragrantly scented with orange. They fit perfectly alongside coffee or tea. Whisk together all but 1 tablespoon of the flour with the baking powder, and salt in a large bowl. Using your hands, rub the butter into the flour mixture, squeezing and pinching until the mixture resembles a coarse meal with chunks no bigger than the size of a pea. Add sugar, orange zest. Toss currants with remaining tablespoons of flour and then add those to the mix; whisk to combine. Pour the half cup of cream and egg in a small dish and beat with a fork. Pour this into the flour mixture and combine gently. The dough will look pretty dry and shaggy. Turn out onto work surface and quickly pull the dough together into a rough mass. Press and knead until it just comes together. To keep the scones tender, try to do this in as few kneads as possible—preferably no more than 12. Don't worry about the excess flour, not all of it will be absorbed. Pat into a rough circle that is about 1-inch thick. Cut the circle into wedges (8 small or 6 large) like a pie, placing each wedge on the prepared baking sheet. Pour a splash of cream in a bowl and lightly brush the top of the scones, then sprinkle each with a little bit of sugar. Slide into preheated oven and bake for 10-14 minutes, until lightly golden. Transfer to a wire rack to cool slightly before serving. This month's edition of Food 'n Flix is being by Kimberly at Coffee and Casseroles with her pick, The Jane Austen Book Club. If you'd like to join us, submissions are due by 12/28/15. If you don't have time to join us this month, but would like to start up in the new year, pick up a copy of Failure to Launch since that is January's flick pick as chosen by our next hostess, Amy at Amy's Cooking Adventures. 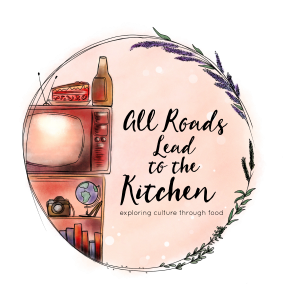 I am also sharing this with the Fandom Foodies #JaneAustenBites link-up, right here at All Roads Lead to the Kitchen!